“On 15 August 1917 Special Regulations 41 and 42 made the silver cross the badge of the chaplaincy for all uniforms and placed it on the coat collar where other officers wore insignia of branch. This implied that chaplains should wear insignia of rank in the same manner as other officers…” (Honeywell, pg. 157). 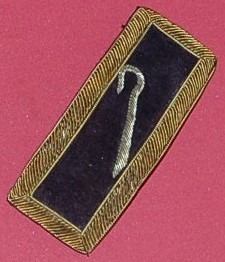 In May 1918 the War Department published regulations implementing the recommendations made by General Pershing in a cable to the Secretary of War in March 1918 which removed insignia of rank from chaplains’ uniforms and moved the silver Latin cross from the collar to the shoulder loop, though some chaplains “ignored the order and continued to wear the insignia” (Stover, pg. 205). About this time, with the increase in Jewish chaplains, the Secretary of War “authorized Jewish chaplains to remove the cross.” Then “on 15 October 1918 Jewish chaplains were authorized to wear a distinctive insignia representing the ‘Tables of the Law surmounted by the Star of David'” (Stover, pg. 204). .Grade insignia didn’t return to chaplains’ uniforms until Army policy changed on 19 March 1926. Honeywell, Roy J. Chaplains of the United States Army. Washington, D.C.: Office of the Chief of Chaplains, Department of the Army, 1958. Stover, Earl F. Up From Handymen: The United States Army Chaplaincy, 1865-1920. Washington, D.C.: Office of the Chief of Chaplains, Department of the Army, 1977.